VMware has announced it is entering the hyper-converged appliance market in conjunction with hardware partners for them to ship pre-built hardware appliances running VMware software. See my introduction, VMware Marvin comes alive as EVO:Rail, a Hyper-Converged Infrastructure Appliance. The EVO: RAIL management software has been built to dramatically simplify the deployment of the appliances as well as provisioning VMs. The user guide is only 29 pages so you can get an idea of how VMware is driving simplicity. Marvin actually exists as a character icon within the management interface with an embedded “V” and “M”. VMware recognises that vCenter has had a rather large feature bloat problem over the years. They have introduced new components like SSO which do provide needed functionality but add to the complexity of deploying vSphere. VMware has also tried to bring all these components together in the vCenter Server Appliance (VCSA). This is great but has some functionality missing compared to the Windows version like Linked-Mode and some customers worry about managing the embedded database for large deployments. As EVO:RAIL is aimed at smaller deployments and isn’t concerned with linking vCenters together, the VCSA is a good option and the EVO:RAIL software is in fact a package which runs as part of the VCSA. 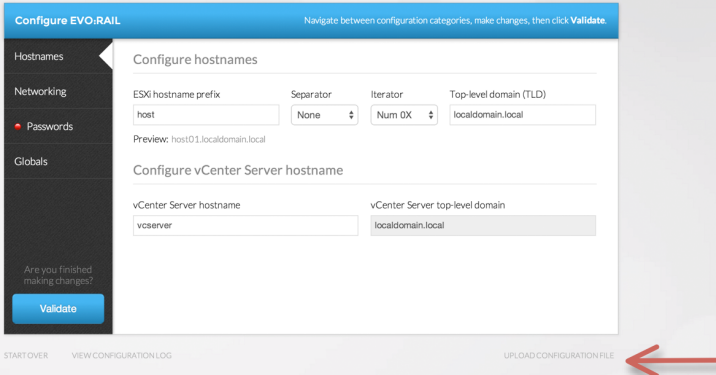 There is no additional database required, it is all built into the appliance and uses the same public APIs to communicate with vCenter but acts as a layer to provide a simpler user experience, hiding some of the complexity of vCenter. vCenter is still there so you can always connect directly with the Web Client and manage VMs as you do normally and any changes made in either environment are common so no conflicts. EVO:RAIL is also also written purely in HTML5 even for the VM console, no yucky Flash like the vSphere Web Client and it works on any browser, even an iPad. Interestingly is has a look which is a little similar to Microsoft Azure Pack. Who would ever have thought VMware would have written a VM management interface built for simplicity that is similar to an existing Microsoft one! 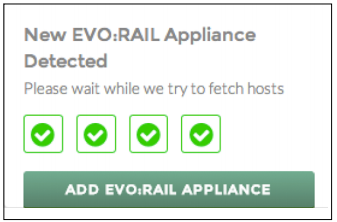 Once you have your appliances physically connected to the network, you connect via a laptop or workstation and browse to the EVO:RAIL IP address. You then click on Yes, Let’s Go! Just Go! 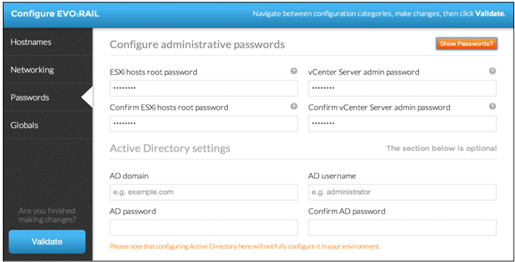 automatically configures the IP addresses and hostnames you specified when you ordered EVO: RAIL, you just create two passwords for all the ESXi hosts and vCenter. 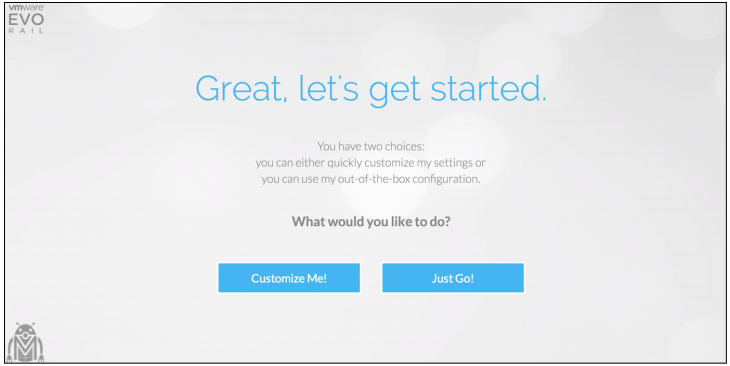 Customize Me! allows you to change all the defaults which are pre-filled in other than the passwords. Upload Configuration File allows you to upload an existing json configuration file with your configuration. This can be used to deploy appliances to branch offices where you have pre-configured all settings in advance. Hostnames for vCenter and an ESXi host naming scheme. This is also the screen you can use to upload your pre-created json configuration file. Global settings for time zone, existing NTP, DNS and servers as well as an external Log Insight or third-party syslog server if you are not using the built-in Log Insight server. You then click on Validate and EVO:RAIL checks the configuration information and then builds the appliance, creating the ESXi hosts and configuring vCenter. This takes about 9 minutes! When done you get a friendly message. Clicking on ADD EVO:RAIL APPLIANCE only asks you for the passwords you created before if you had pre-allocated the IP addresses. 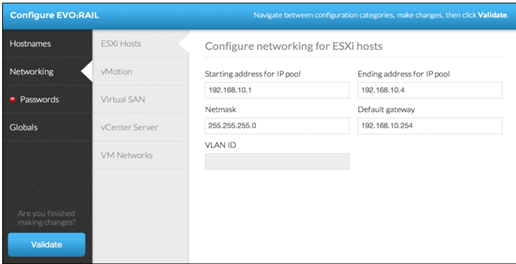 EVO:RAIL will then push out the configuration automatically to the new appliance, configure the networking, add it to the cluster and VSAN without you needing to do anything. EVO:RAIL simplifies VM creation with just a few clicks to select the guest OS, VM size, VM network and also has a new addition of some security options. You will still need OS software to do the actual install so need to upload the OS .ISOs or mount them from somewhere. 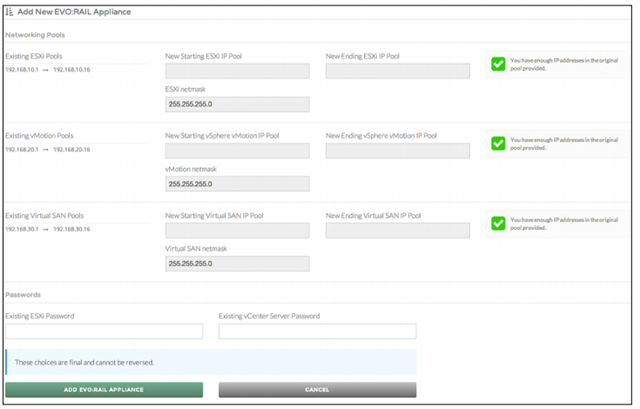 VM sizing is simplified by offering options of small, medium and large configurations which are different for each guest OS. You can then set one of three pre-set security policies (Basic, Default, Secure) which is a new addition not present in any other vSphere product. 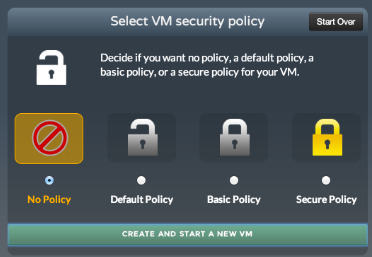 You can also select No Policy if you don’t want advanced VM security. vSphere 5.5 Security Hardening Guide. These are only VM policies so its not going to harden the ESXi hosts but provides some settings to at least harden VMs. The more secure the policy, the more VM functionality you will lose such as automatically updating tools, shrinking disks, limiting console connections, blocking device interactions etc. The EVO:RAIL interface allows you to list, search, sort and filter your VMs very quickly. There’s also vSphere Web Client Logo which you can click on to open up the full Web Client in another browser window. CPU, memory, storage and VM usage for the whole cluster as well as individual appliances and nodes. You can generate a log bundle which will zip up diagnostic logs from vCenter, ESXi and EVO:RAIL which can be uploaded to a support request. VMware is not using VMware Update Manager (VUM) to manage the software and firmware updates. EVO:RAIL will have its own updating system. This could be because VUM is not fully integrated into the Web Client and therefore needs a Windows VM. Perhaps is also means VMware now has other plans for VUM and is going to do something different for software updates. VMware has plans to extend the EVO:RAIL functionality in the future with integrations with initially Horizon View and will then look at other applications. EVO:RAIL and in the future EVO:RACK and whatever else it scales to is certainly a new way to manage your virtual infrastructure in a pod-like approach. I wonder what plans there are to bake the management functionality into vCenter itself without the appliance. VMware already has client web interfaces for vCD, vCAC, vCenter and now EVO:RAIL so there is certainly room for a consolidated and simplified experience. The vSphere Web Client took a step forward with functionality and certainly partner integrations but took a massive step back by using Flash. VMware has to make a pure HTML5 client for vSphere as well, perhaps taking cues from the simplified interface of EVO:RAIL. EVO:RAIL isn’t going to easily co-exist with the rest of your vSphere environment but that’s not the idea. You can’t vMotion a VM between vCenters so wouldn’t be able to link up multiple EVO:RAIL pods and create a super EVO:WHATEVER yourself. I’m always a champion of simplicity so like this additional management interface. As for the appliance it will be interesting to see what incumbent and new hardware vendors start announcing EVO:RAIL appliances. Is it just me, or does this product seem unnecessary? I just don’t get it. Maybe it helps people with no VMware training or experience. If you have a VMware based infrastructure of any appreciable size, you already have a substantial investment in the technology. This product seems like a stupid toy. Maybe I need to see it in action but you did a good job explaining it. I see this as a marketing team gimmick. Pretty pictures and big candy-like buttons to smooth over the brass, with no actual substance. I see this as another stupid step VMware is making with their UI policy. Hell, I might as well go with Hyper-V at this point. Great post Julian. I think it’s a good release which will increase adoption of hyperconverged solutions in the SMB space although the separation/management could be a sticking point. The simpler interface is nice and slick but part of the sell is the fact it’s the familiar VMware technology – but you can’t add manage it using your existing vCenter environment. 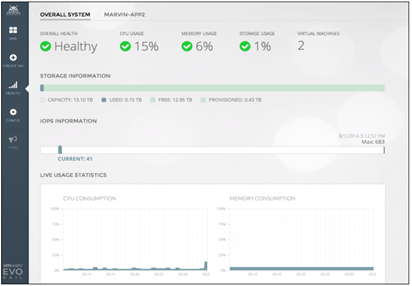 What if you have vCOps (ok, vRealize Operations) – can you leverage that to monitor this? I don’t believe you’ll be able to leverage any pre-existing licencing discounts with VMware as with EVO:RAIL it’s done through the OEM. As you say that’s not the point of EVO:RAIL but taken together they’re a significant constraints.